WARMBAC was founded in 1972 and is based near the Mendip Hills, Somerset, England. 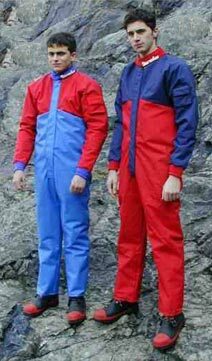 Our aim?......to design and produce clothing specifically for caving. The NEO-FLEECE SUIT was also designed by Warmbac and has become our most popular wet suit. Our product range also includes over suits, under suits, tackle bags and many accessories. We are constantly searching for new materials that will enable us to update our designs. As part of our ongoing commitment to further enhance our designs, we developed WARMTEX. WARMTEX is the most abrasion resistant material available. Vietnam, China, Iran and Irian Jaya. water skiing as well as suits for juniors.